If you're used to seeing the other Fractal Design Define enclosures, looking at the Mini may actually hurt your brain a little bit. The Define XL, Define R4, and Define Mini all look fundamentally the same in terms of style and aesthetic, but each one goes a little funhouse mirror in the process. Without examining its dimensions or putting it next to another enclosure, it might be hard to appreciate the slightly smaller form factor of the Define Mini. The front of the Define Mini sports a padded door that swings open to the left along with ventilation on both sides of it to allow air to flow into the intake fans (and thus into the case) without letting the noise from the intakes escape. There's the familiar LED notch and ring just above it, along with the power button and I/O cluster, all right on the front edge just like the other Defines. Fractal Design hides the reset button behind the door, next to the pair of 5.25" bays. Below those bays are the two intake fans, with doors of their own that swing open to allow you to both change out the fans but also remove their filters for cleaning. Examining the top, sides, and back of the Define Mini reveals few surprises. The left side includes the traditional ModuVent removable panel to allow the end user to install a 120mm or 140mm side intake fan, while the right side is blank. Meanwhile the top of the case has another 120mm/140mm ModuVent. I'm never really unhappy to see this feature in a case, especially as it's proliferated. Something like this adds flexibility to the case design. Finally, the only hiccup in the back is the fifth expansion slot aligned vertically, presumably for mounting the included fan controller. Fractal Design uses a pair of thumbscrews to hold each side panel in place, and unfortunately the side panels are notched instead of hinged. I'm never happy to see this, but the Define Mini is at least small enough to prevent the panels from being too difficult to replace. The motherboard tray is business as usual, with fairly smartly laid out routing holes for cabling. Unfortunately we're only looking at about 160mm of clearance above the motherboard, which makes installing any radiator in there a tight fit; the 120mm exhaust fan also means you'll have to orient any radiator carefully with the hoses above or below the mount. Everything else inside the Define Mini is Fractal Design par for the course. Of the two drive cages, the top one is removable, but inexplicably, the bottom one is not. Fractal Design opted to use rivets instead of screws to mount the bottom cage, but there's no real reason not to make this something the end user could remove. Thankfully they continue to use their metal drive trays, which are among the best and most secure I've seen. While the Define Mini is really surprise free for anyone familiar with Fractal Design's cases (and thus knowing what to expect), there's one tremendously goofy wrinkle: only one USB 3.0 port. It uses the full internal motherboard header, but every time I see something like this it seems like such a waste, especially when there's obviously space in the fascia to include a second. Outside of this, though, the Define Mini is at least superficially what you expected and were hoping for. It can be quiet. It's loud just like any open? 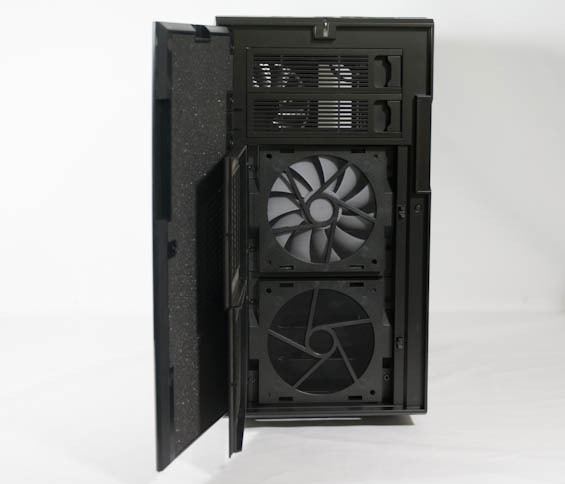 case with direct airflow. So it's up to your components. The big 180mm? fan on the TJ08e can be undervolted and be set quiet, it's 180mm! so it'll still pump out good air. After that it's up to your components, so pick a good cpu hs/f, quiet gpu, HDD's that don't vibrate too much, etc, etc. That's probably because the noise of your games is masking the noise of your case. The TJ-08E is great* quiet case, with the caveat being that you need to undervolt that sucker of a 180mm fan. Although that's not too hard given that you can buy them from fleaBay for a couple of bucks if you don't want to weld some resistors to a bit of wire. The Define Mini also is easier to assemble than the TJ-08E, but it's also 10cm longer and thus, heavier. The TJ08e is definitely a pain to muck around in because of the cramped space. My hands are pretty big, so squeezing them into case to mess with fan headers is pretty close to impossible. I wish it was just an inch bigger in each dimension. 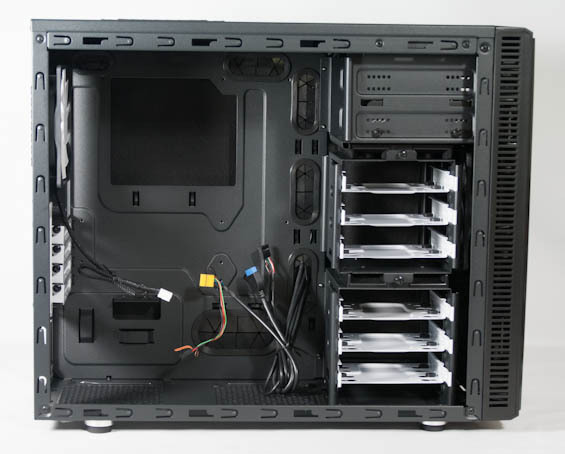 The hard drive cage in the TJ08e also has major interference issues with many full-sized tower coolers. It's virtually impossible to mount a 3.5" HD in this cage with anything but a smallish (90mm) tower cooler, or maybe a 120 with the fan flipped to the other side (which in my situation had other interference issues on the other side of the board).